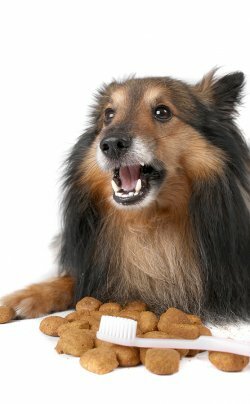 Pet dental care is essential for your animal's health. Animal Medical Center provides pet dental services as a part of a pet preventative care plan. Dogs and cats need regular dental check-ups to keep their teeth and gums healthy and free of disease and infection. Pet dental hygiene is one of the most commonly overlooked areas of pet health care. Periodontal disease is the same in pets as it is in humans. When teeth are not cleaned and cared for regularly a film known as plaque starts to form on the teeth. This film breeds bacteria and can cause bad breath, which is often one of the first signs of dental or gum disease. Statistics show that approximately 80% of all dogs and cats have periodontal disease by the time they are two years of age. Dental disease is much more than just bad breath. If it is not treated it can lead to serious health problems such as liver, kidney and heart disease. Our veterinarians take the steps to administer good pet dental hygiene. We offer regular dental check-ups, which include a professional cleaning using tartar removal tools. Our well trained and professional Animal Medical Center staff will also provide you with the instructions and information you need to take care of your dogs and cats teeth at home. It is important that you take the correct pet preventative care steps at home to keep your pet's teeth healthy. Veterinary studies show that good dental hygiene and healthy teeth can extend your pet's life up to five years. As a pet owner you can care for your animal's teeth between checkups with regular brushing, appropriate chew toys and treats. These things not only keep teeth clean, but will help prevent plaque build-up which can lead to tartar forming on the teeth. Tartar makes a rough surface for bacteria to stick to and can lead to gum inflammation and infection called gingivitis. If not treated, gingivitis will spread to the tooth roots and even the jaw bone causing tooth loss and pain. Dogs and cats need pet dental check-ups at least once yearly; however oral hygiene at home needs to be a daily activity. Dental exams are free in our veterinary clinic. After the examination our veterinarian and his technicians will share their findings with you and design a dental treatment plan specifically for your pet's dental needs. At Animal Medical Center our veterinarian promotes and sponsors a total animal health and wellness program. This program includes pet dental services and other preventative care services such as vaccinations, spay and neuter procedures, hygiene services like bathing and grooming as well as other veterinary care services. Dental examinations and other types of appointments are easy to schedule in our clinic; you can make an appointment by phone and online. We have registration forms for medical and dental services on our website ready to print so that you can fill out all the paperwork ahead of time to expedite your wait time when you get to our center. To make an appointment for your pet, call our office at 661-255-5555.